New Delhi: Finance Ministry sources today said on condition of anonymity that committee under Finance Secretary Ashok Lavasa has been set up to examine the suggestions of the 7th Pay Commission on allowances, has been working to make the new allowances structure keeping in mind the inflation. The sources revealed that the committee will consider the high cost of housing rent in cities while fixing the new house rent allowance (HRA) and it will submit its report on new allowances of 48 lakh central government employees. “At this moment it is difficult to say, but it will take at least one month,” they said adding that the time limit can’t be extended. Responding to various queries and opinions sources said issues like inflation, the government’s financial position and new salary structure of government employees would also be taken into consideration before submitting the report on new allowances. By giving house rent allowance hikes, the committee is likely to seek to encourage property owners to rent out their properties, reduce the shortage of dwellings and to provide ‘housing for all central government employees’, sources added. Besides the basic salary, a large portion of central government employees’ salary is the house rent allowance; so no changes of percentage will be made in this category of allowance this time, they confirmed. Accordingly, ‘X’ class cities Ahmedabad, Bangalore, Chennai, Delhi, Hyderabad, Kolkata, Mumbai and Pune, where employees will get 30 percent of their pay matrix as house rent allowance (HRA), no increasing from the existing 30 percent. Employees posted at ‘Y’ class cities covers near about 90 stations, will receive 20 percent of pay matrix, at the existing percentage. In other areas, the house rent allowance will be 10 percent of pay matrix, which is the existing rate of house rent allowance (HRA) of ‘Z’ class cities. While the pay commission recommended HRA for these cities to 24%, 16% and 8% respectively of the pay matrix. The Finance Secretary Committee on allowances will not propose to increase the rate of transport allowances of central government employees, they will go with ditto the 7th Pay Commission recommendations, they stressed. 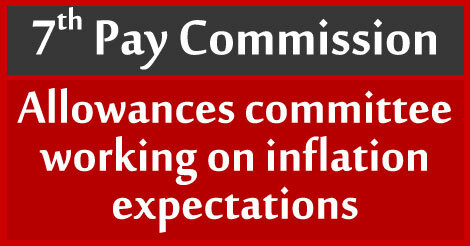 The 7th Pay Commission had recommended abolition of 51 allowances and subsuming 37 others out of 196 existing allowances. The representatives of the employees unions had earlier conveyed to the centre that they did not want it to approve the 7th Pay Commission recommendations on allowances without examining them further. So cabinet referred it to the Finance Secretary committee to examine, when it cleared the recommendations of 7th Pay Commission in respect of the hike in basic pay and pension on June 29.